Dr. S. Janardan, an orthopedic doctor answers a few basic questions related to arthritis, its prevention as well as some other orthopedic problems on the occasion of "World Arthritis Day" - 12th October. Dr. S. Janardan, an orthopedic doctor has years of experience in treating patients with the spine injury, back pain, trauma and several such orthopedic problems. On the occasion of "World Arthritis Day" - 12th October, Dr. Janardan answers a few basic questions related to arthritis, its prevention as well as some other orthopedic problems. Health Team - Is arthritis a hereditary disease? Any steps to take to avoid arthritis for a person with a family history? S. Janardan (SJ) - Not all forms of arthritis are inherited. Optimal weight can mitigate the effects of arthritis. HT - Arthritis pain increases during cold season. Is that true? SJ - Cold and damp weather is often said to increase or bring in the joint pain. 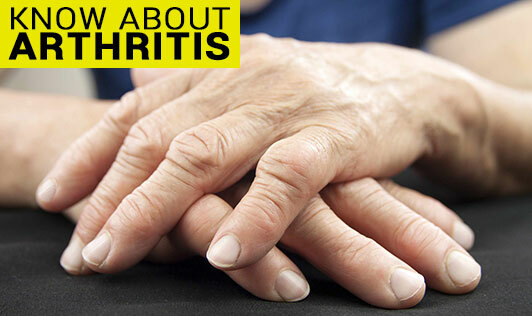 HT - Does having brinjal, tomato and green leafy vegetable tend to increase pain in arthritis? SJ - Food has very little effects on arthritis. HT - The movements in a person with shoulder arthritis are restricted, how does that have an impact on a long run? SJ - The shoulder arthritis on a long run interferes with activities of daily living. The patient should take the right treatment to get control on the pain and do daily activities with ease. HT - Is Ayurvedic treatment good for pain and arthritis? SJ - Ayurveda is said to be a lifestyle treatment, to be practiced on a daily basis. I cannot comment beyond this. HT - What is the prevalence and reason for Juvenile arthritis in India? SJ - The condition of juvenile arthritis is not very common in India. Many may be infective or familial (hereditary). HT - What is an ACL tear? How do we know when ACL reconstruction surgery is necessary? SJ - ACL is the Anterior Cruciate Ligament, which is one of the major knee ligaments. The ACL tear occurs inside when the knee is disrupted or torn. An unstable joint condition indicates a necessity of a reconstruction surgery. HT - Many people think that taking calcium supplements help in relieving the joint pain faster - myth or truth? SJ - It is a myth. Application of ice, rest, yoga and exercises as per the trainer's guidance helps to ease the joint pain and not the supplements. CHT - Some tips for early management of knee pain and arthritis. SJ - At the cost of repetition - LOSE weight. HT - What is ligament laxity? What are the treatments available? Is it curable? SJ - Loose connective tissue is called congenital laxity of ligaments/ ligament laxity. It is an inherited condition, cannot be cured completely, but measures can be taken to prevent the injury. HT - What should be avoided if one has ligament laxity? SJ - Those with the above condition should avoid extreme sports, gymnastics, etc. It is better to consult a doctor before you start any kind of exercise. HT - What is the reason for heel pain and what are the treatments available for heel pain? SJ - This is generally because of an excess injury/ stress of the heel ligament. Good footwear, optimal body weight and avoiding very hard flooring surfaces etc. can help. • What are the different methods that a low back pain can be avoided by the young generation and the middle aged people? • Can physiotherapy give a permanent solution to a person with low back pain/injury? • How much of impact does being overweight/obese put on low back pain and knee pain. • These days we hear a lot on RSI (Repetitive Stress Injury). Why do people get it and what are the measures to avoid them?